Why does my order state that it was posted from USA when I am paying international shipping costs from UK ? To maximize speed and efficiency of the deliveries to USA, the items may be posted from UK in bulk to my friend in USA who then splits up the orders and posts them individually. A large proportion of my sales are in USA and I have found this to be the best way to ship. It also helps in the unlikely event that there is a problem with the order and it needs returned. How long will it take to receive my dress? Orders take six weeks to be delivered from date of order for standard orders. 'Rush Orders' take four weeks and cost an additional £13. You can select the 'rush order' option by adding this to your shopping basket prior to check out. We appreciate you need to get your dress on time so rest assured your order will always be delivered in the promised time frame! Can I customise my dress? How much does this cost? 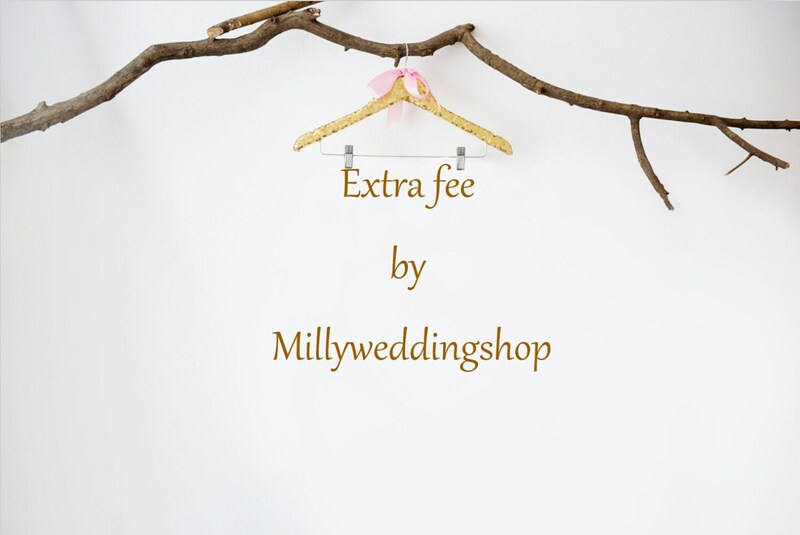 Here at Milly Wedding Shop, we specialise in customising dresses! We offer a unique service where we can make a dress to your measurements and change the colour at no extra cost. Please contact us with any colour requests that you have. How do I place a customised order? 2. For a dress you would like to have in a different colour, please contact us via the contact form and one of our team will get back to you with a personal reply. I make to order and I aim to make the dresses with high quality and best fit, provided that I have accurate measurement information, therefore, I will only take returns if there's any defect with the dresses themselves. I hope that's understandable. Our dresses run true to size and we always allow an extra inch of 'wiggle room'. Please refer to our size chart (which can be found after the last photo of every item) to select the best fitting dress. If you are unsure of which size to order, we recommend that you err on the larger size, as a little room for movement is more desirable than a dress that is too tight! Can I check the status of my order? I want to know how soon my dress will arrive! We understand how important it is to receive your dress on time! We promise that your order will arrive by the delivery date quoted in your order confirmation email. I notice that your dresses are offered in an Ivory colour but not White. Can I order a dress in White? Many of our standard dresses come in our popular Ivory colour which is a pale, off white shade rather than a more creamy colour. We do not offer White as a standard colour as this can look quite stark when made up. We recommend that customers order a fabric sample if they are unsure which shade to order. Fabric samples can be ordered from our Etsy shop. We do have White fabrics available if it is a true white you are looking for. Please add a colour request in the 'notes' section when ordering your dress. I am not sure if your dress will coordinate with my wedding party's colours. Is there any way to see the fabric before ordering a dress? We offer a fabric swatch service on all of our satins and tulle fabrics. These can be ordered from our Etsy shop directly. If you would like to see available colours, please contact us. Thank you so much for the beautiful dresses! We order 3 costume dresses and we are very happy with the purchase. The dresses were well made and according to measurements. Beautiful detail just like the sample picture. Wonderful customer service and great communication. Responded to emails promptly. Order was done quickly and shipping was fast. Will order from Milly again and highly recommended!